It is Wednesday, so he is at the diner. This has been the routine for over a year now, since he met Sensei Shane and started working out at the dojo down the road three days a week. After his Monday practice, he runs errands. Fridays are for spontaneity, and Wednesdays are for reading, for breakfast served all day and Lillian the waitress refilling his bottomless cup of coffee. He’s been working through all 1,200 pages of The Essential Zizek for the better part of six months. Like the martial arts, Zizek is an exercise not without pain, but pain can be the best instructor. Reaching for his highlighters – green is for lines he likes, orange for ideas he does not yet understand – he sees the screen of his phone light up. It’s a 617 number again, the area code for Boston. He listens to the phone vibrate against the laminate table, watching the screen change from the number to 1 missed call. This is a misnomer, as he misses neither the call nor the caller. He’s heard it’s been a tough stretch in Boston, especially after they let Francona go. The answer to the growing unrest is to trot out the beloved 2004 team as much as possible: first pitches, the 100th anniversary of Fenway, pregame ceremonies with no purpose other than emotional transference. They call him every time but he’s skipped, and will skip, it all. Memories are short. He’s moved from goat to hero to goat to blip, the answer to a trivia question, the rumored owner of a Dunkin Donuts. He begrudges the fans nothing; Sensei Shane has taught him better. His name was on tee shirts – some licensed, some printed up by smartasses (how they settled on Who Died and Made You Mark Bellhorn, he’s long since stopped pondering). He has a World Series ring and a Sports Illustrated cover, the latter more of a compliment to the photographer than to the guy everyone wanted benched. For a while, girls invited themselves back to his apartment, expecting more than Miller Lite, Kraft macaroni and cheese, and the same futon he’d had in the minors. It was not the best part of his life but it was the most unexpected, which was enough to keep him going at least two years beyond the time to walk away. 1 missed call becomes 1 voicemail. He deletes it. Lillian passes by with the coffee pot, her eyes crinkled into a smile, and refills his mug without asking because she knows the answer is always yes. Not only is she efficient, but her waist to hip ratio is quite admirable. He stirs more milk into his coffee, trying to think of something to say to keep her there, but the spoon flips out of his hand and splatters hot liquid across the table and Zizek. Lillian grabs a wad of napkins and pats his arm as she moves to the next booth. Rolling the tightness from his shoulders, he scans the page for the passage he’d been reading, the one about moving beyond desire. He grabs the green highlighter. Amy Rossi is a North Carolina native who lives in Boston and cheers for the Brewers. Her work has previously appeared in decomP and Monkeybicycle, and she is a member of the 3-4-5 writing community. 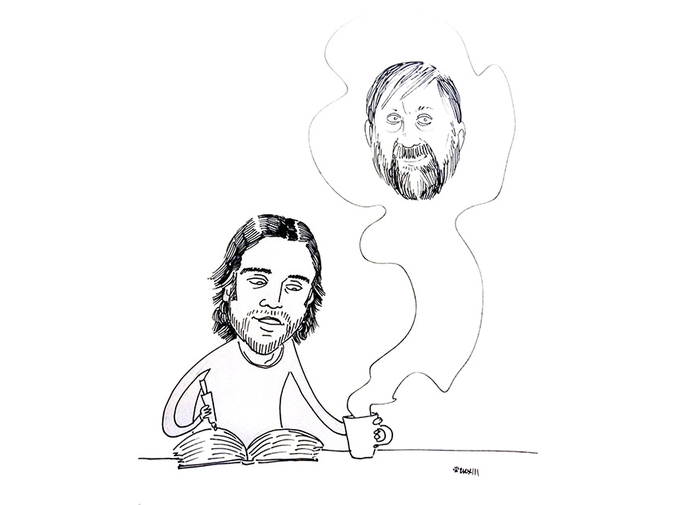 Samara Pearlstein is an MFA candidate at the School of the Museum of Fine Arts in Boston, where it's a little weird to draw stupid cartoons, although it's ok when they're about Zizek. More of the baseball stuff can be found at Roar of the Tigers.